Approx. Size : 7 " L + .25 " W / Clear Rhinestone / Black Band / Elas..
Approx. Size : 7 " L + .4 " W / Clear Rhinestone / Blac..
Approx. Size : 7 " L + .25 " W / Clear Rhinestone / Black Band / El.. 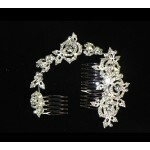 Flexible Bridal Hair Comb / Rhinestone / Approx. Size : 10.50 " (L) 2.50 " .. Size : 11 " (L) Flexible Crystal Hair Piece with Pearl Out of Order .. Size : 11" (L) Flexible Crystal Hair Piece .. Size : 10 " (L) Flexible Crystal Hair Piece with Pearl .. Size : 11 " (L) Flexible Crystal Hair Piece .. Flexible Hair Piece with Pearl ..
Approx. 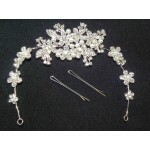 Size: 11 " (L) Flexible Crystal Hair Piece in Silver / Lead & Nickel Free ..
Approx. Size: 11 " (L) Flexible Crystal Hair Piece / Rhinestone / Alloy / Lead & Ni.. Size : 11 " (L) Flexible Crystal Hair Piece with Pearl ..